Note: This tutorial assumes that the user has experience in writing basic Qt applications, designing user interfaces with Qt Designer and using the Qt Resource System. 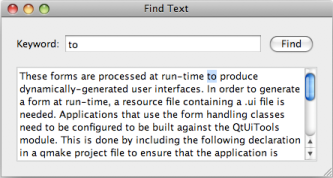 In this example, we describe the steps involved in using Qt Creator to create a small Qt program, Text Finder. Inspired by the QtUiTools' Text Finder example, we write a similar but simplified version of it, as shown below. 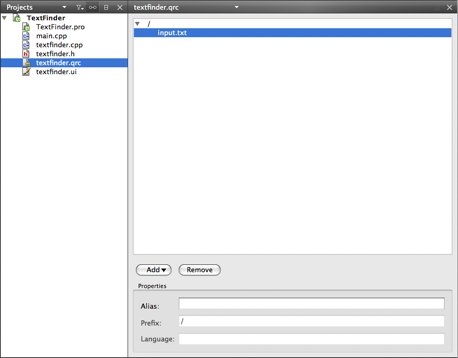 Once you have installed Qt Creator, it detects automatically if Qt's location is in your PATH variable. If not, please follow the instructions in Qt Version Management. We begin with a Qt4 Gui Application project generated by Qt Creator. The Creating a Project in Qt Creator document describes this process in detail. Remember to select QWidget as the Text Finder's base class. If your project is not yet loaded, load it by selecting File > Open. The .h and .cpp files come with the necessary boiler plate code. The .pro file is also complete. We begin by designing the user interface and then move on to filling in the missing code. Finally, we add the find functionality. To begin designing the user interface, double-click on the textfinder.ui file in the Project Explorer. This launches the integrated Qt Designer. We recommend that you use a QGridLayout to lay out the label, the line edit and the push button. The grid layout and the text edit can then be added to a QVBoxLayout. If you are new to designing forms with Qt Designer, see the Qt Designer Manual. Note: The Ui::TextFinder object is already provided. Once we have both of these functions complete, we call loadTextFile() in our constructor. 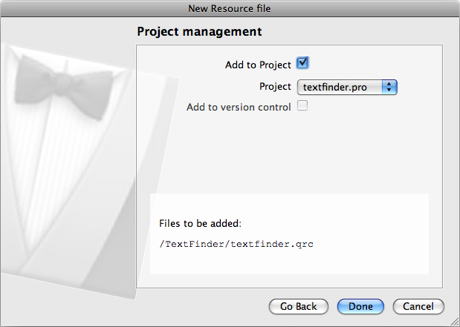 We require a resource file (.qrc) within which we embed the input text file. This can be any .txt file with a paragraph of text. Right-click on Resource Files in the Project Explorer. The wizard dialog below is displayed. 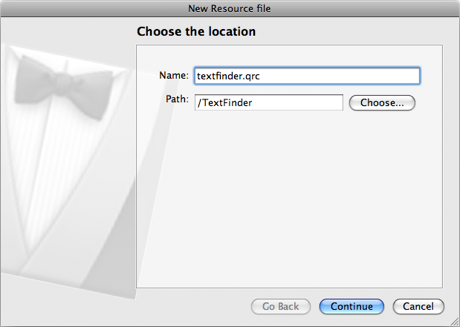 Enter "textfinder" in the Name field. Use the given Path. Choose to which project you want to add the new file. Select "TextFinder" as the Project. Make sure that Add to Project is checked. Your resource file is now displayed in the resource editor. Select Add > Add Prefix from the drop-down list. The prefix we require is a slash (/). Select Add > Add File from the drop-down list. Locate the text file you are going to use. We use input.txt. Now that you have all the necessary files, click the button to compile your program.